All our professionals at John E. Hall Jr., DDS maintain the highest levels of accreditation and pursue ongoing education to stay abreast of the latest trends in dentistry. Dedicated to providing the best dental care possible, Dr. John Hall has been practicing Dentistry in the Atlanta/Decatur area since 1983. Dr. Hall is an experienced dentist who adopts a kind and caring approach in practicing comprehensive dentistry. He regularly attends continuing education courses and is committed to keeping abreast of current dental techniques and technology. An advocate of preventive care, his goal is to combine quality care and professional service combined with compassionate, gentle treatment of his patients. 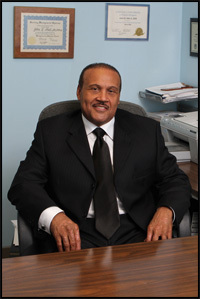 Dr. Hall received his Doctor of Dental Surgery (D.D.S.) degree in 1982 from Meharry Medical College in Nashville TN. and his undergraduate degree in biology from Fisk University, also in Nashville. Raised in Atlanta, Dr. Hall has strong ties to the Atlanta community where he attended Marist and Southwest High Schools and Collier Heights Elementary school. Dr. John Hall holds active membership in many professional organizations including The National Dental Association, The Georgia Dental Society, and The North Georgia Dental Society to name a few. He is also the former dental director of Sadie G. Mays nursing home in Atlanta where he obtained much experience in working with the geriatric dental patient. In his spare time, Dr. Hall enjoys golf, tennis, music, water sports and spending time with his young daughter, Margaret. He is the son of Dr. John Hall, Sr., retired pediatrician, and the late Margaret Hall.